Adventure is everywhere. Capture it. Live. An island retreat – Lankawi – Malaysia. New Years Eve sunset on Lankawi’s Pentai Cenang beach. Kuala Lumpur is a sparkling metropolis with many cultures all melted into one. But if it’s sun, sand and sea that you’re after then Malaysia’s Lankawi island, just an hours flight from KL, is a haven of stunning beach tranquility. For a small island, there is a huge variety of styles and levels of accommodation from hostels to luxury resort hotels and all have their charms. The main beach, Pentai Cenang, is bustling but is still a wonderful paradise of white sand and azure waters where you can partake in a variety of reasonably priced water sports if the mood takes you. By night, the beach is buzzing with bars and fire dancers that draw crowds via incredible sea food barbeques; this beach has everything, not least an exhilarating atmosphere. When visiting Lankawi, you will be bombarded with options for both day and night activities, it will be hard to choose and even drag yourself away from the stunning beaches. However, there is one thing that you must do when visiting Lankawi and that is take advantage of the many sunset cruises on offer. Yes, I know this sounds like a holiday cliche but it really is incredible value for money and a beautiful way to see the island. The evening cruises usually take a one off payment and that includes all food and drinks for the evening. There are also ample opportunities to launch yourself into the stunning emerald waters if you so desire. As with everything in Lankawi, the prices are very reasonable but this is one thing that you will remember for a lifetime. A.B.C……..Not so easy as 1,2,3! A.B.C: Annapurna. Base. Camp. Nepal is synonymous with the mighty mount Everest and one often thinks of Everest when Nepal is mentioned. The tallest mountain in the world attracts hundreds of tourists each year attempting to reach base camp or even summit. Famous for its starring role in ‘Into Thin Air’ among many other books, documentaries and films. However, in October 2014, it was Annapurna that stepped onto the main stage when blizzards and avalanches in the area brought tragedy claiming the lives of 43 people. By this point I’d already booked my flights to trek in the same area and despite warnings from well-meaning friends, decided to go anyway. Sometimes in taking a risk we make the best discoveries and have real, enriching experiences; this however, was a very real risk. The forests of the Annapurna Conservation Area. canopy of trees. 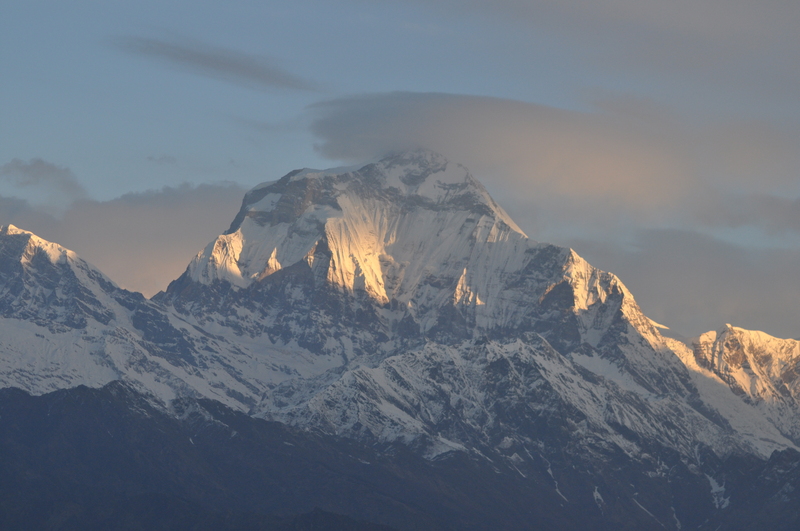 Eventually, the forest thinned out and the mighty mountains of the Annapurna range became visible. 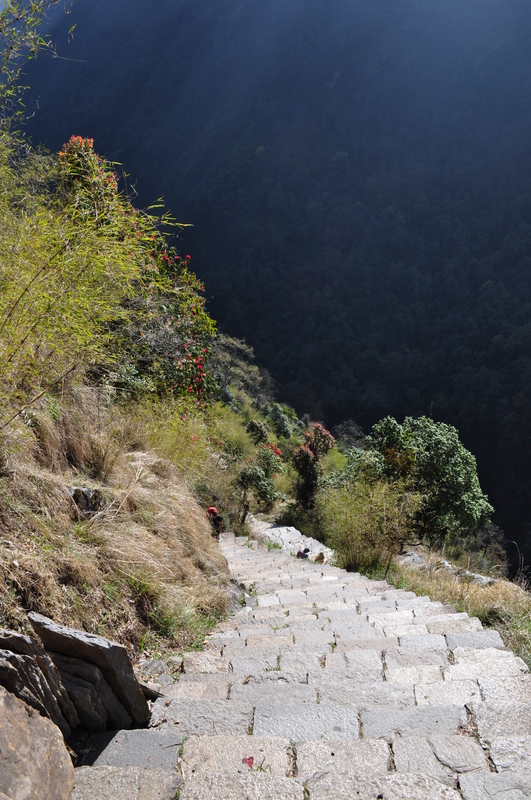 Winding, steep steps led both up and down the mountain paths. It’s hard to put an exact number on the number of steps climbed but I would be sure to put it into the hundreds, at least – it made my legs burn at any rate. On reaching a small town called Dovan, standing at an elevation of 2500m the valley seemed to rise even steeper and the mountains finally gave you a glimpse of the task ahead. The lush, green hills were now replaced by dark, jagged snow dappled mountains that seem to converge conspiratorially, barely shrouding the Annapurna range that lay intimidatingly behind. 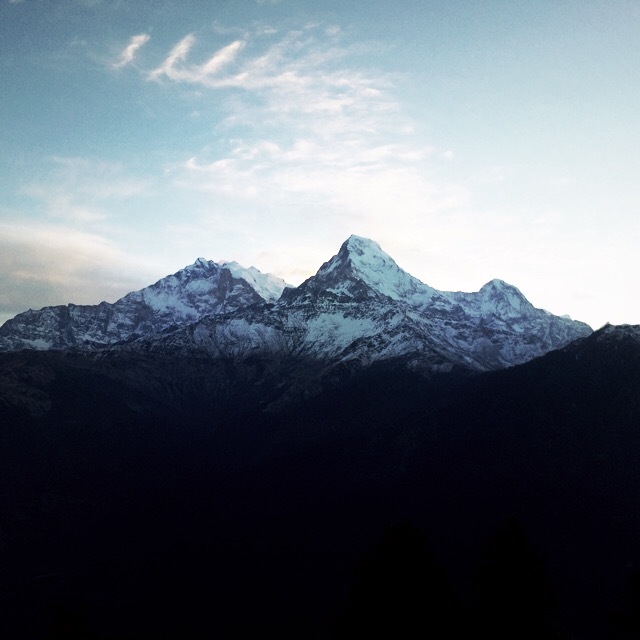 The famous fishtail peak of Machhapuchhre poked out beyond the dark gateway, jagged, gleaming and snow-capped. The clouds hung low casting a further shadow over the darkness that lay ahead and it’s hard to believe that the mountain paths are penetrable enough to walk through. I certainly had the sense that the next few days were not going to be easy and I was starting to understand how small and insignificant I am in the face of these expansive forces of nature. 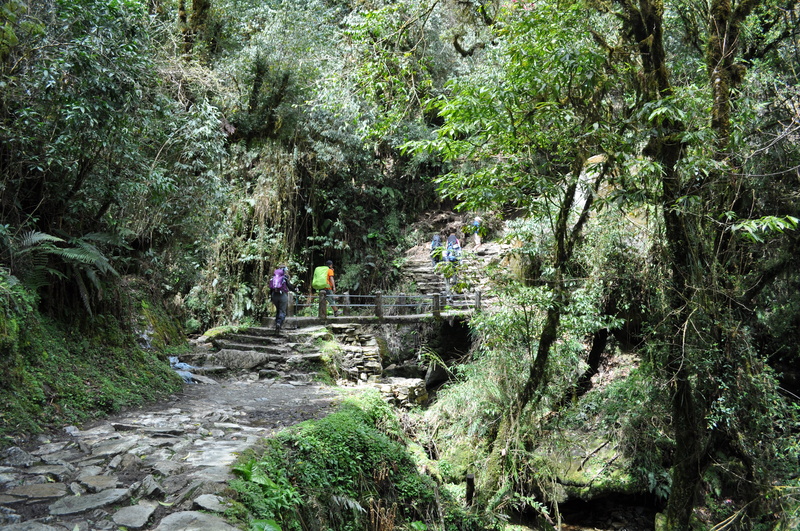 The following day saw us climbing and descending endless stone-stepped paths and for some of the journey we were led back through mountain forests. As we climbed, the temperature took a noticeable fall and it felt as if the darkness was closing in again. I looked over my shoulder and noticed that as the green hills of the valley were disappearing, the billowing grey clouds were descending and appeared to be chasing us on our climb. This is, of course, ridiculous, but it added to the growing sense of nature’s power. Maybe not so ridiculous after all, those eminent clouds grew darker and it began to snow. 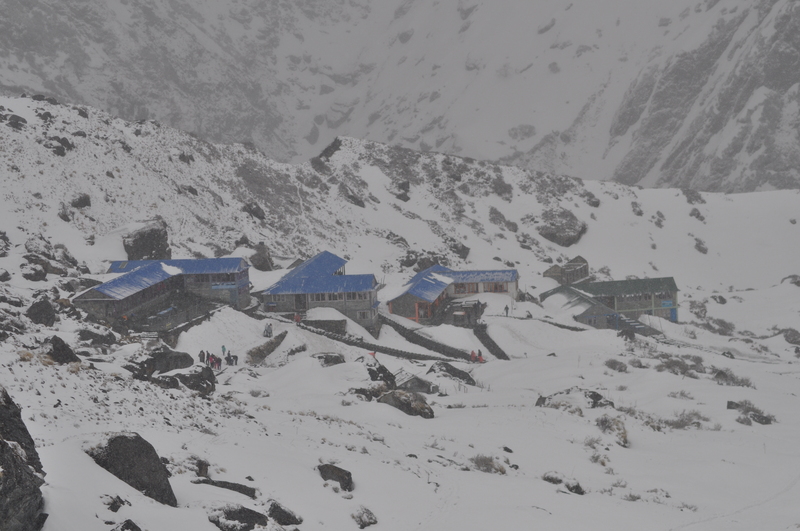 This snow continued throughout the day and the fear of a repeat of last night’s blizzard up at Machhapuchhre base camp was becoming more real. As we continued, we passed a sign that read ‘Avalanche Risk Area’ and then stumbled upon a huge area of snow that had fallen as an avalanche maybe weeks before. Again, the reminders of Mother Nature’s power served to push us on quicker to base camp. As the altitude rose, the upward climbs became much harder and I noticed that I became short of breath more quickly and was having to will my legs to keep moving. As we continued to climb, the snow came thicker and faster and visibility was lower. Every now and again, I would stop, look around and find myself completely in awe of the scenery that surrounded me, at times I felt overwhelmed by the sheer scale of the mountains. The final uphill climb to M.B.C was hard going as the altitude sucked our breath and energy and this was furthered by the heavy snowfall. Walking now became an effort as we had to use our poles to pull us up through the thick snow. By the time we reached M.B.C, neither Annapurna nor Machhapuchhre were visible and the blue roof of base camp luckily poked out of the thickening snow as a sign of hope. The communal area of M.B.C was becoming increasingly jam packed full of climber and trekkers of varying nationalities. As the various groups desperately tried to keep warm in the plummeting temperatures, the anticipation and excitement of tomorrow’s trek to Annapurna base camp was audible. This was heightened by the fact that the heavy snowfall, somewhat uncharacteristic for this time of year, began to lay doubt in our minds as to whether getting to A.B.C would even be possible. However, as night wore on and sleep evaded us due to altitude sickness, the snow gave us no hope of relenting and our dreams of climbing further to A.B.C seemed to be slipping further away with each passing hour. 4 am. Pitch black. I slept in all my clothes last night and in amongst the shivering and what seemed hallucinogenic dreams of altitude sickness, I must have slept….somehow. I opened the door to a clear night sky and waited, apprehensively, for signs of life among my fellow trekkers. 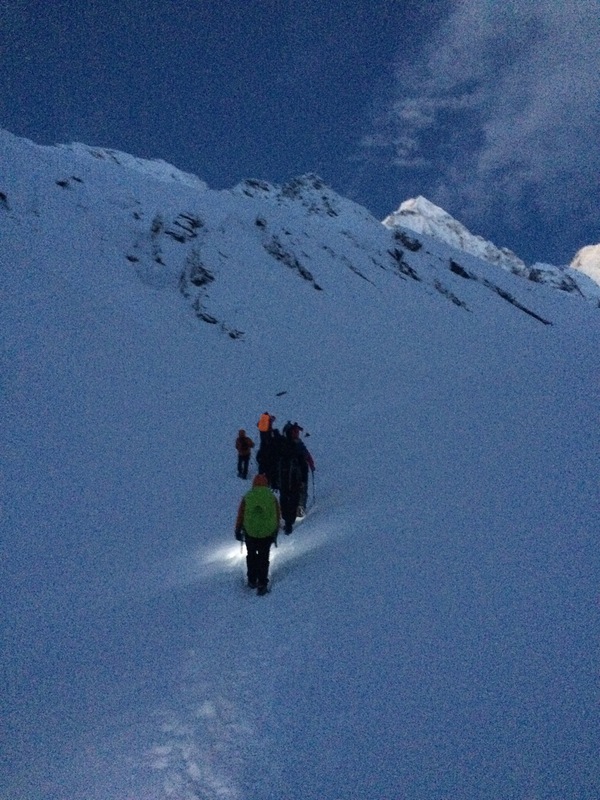 Sure enough, people started to emerge and climbing groups mobilised for an early morning advance to base camp. Despite all the doubt and apprehension, it was happening. Yes, I felt like my head was stuck in a vice and yes, the snow was up to my knees but there was no way that that was going to stop me. Not now. We slowly edged forward, one breathless step at a time following the thin stream of light from our head torches. Gradually as night faded and dawn arose, the incredible, crisp outlines of Machhapuchhre and Annapurna came into view and once again I felt in awe of nature’s mighty power. 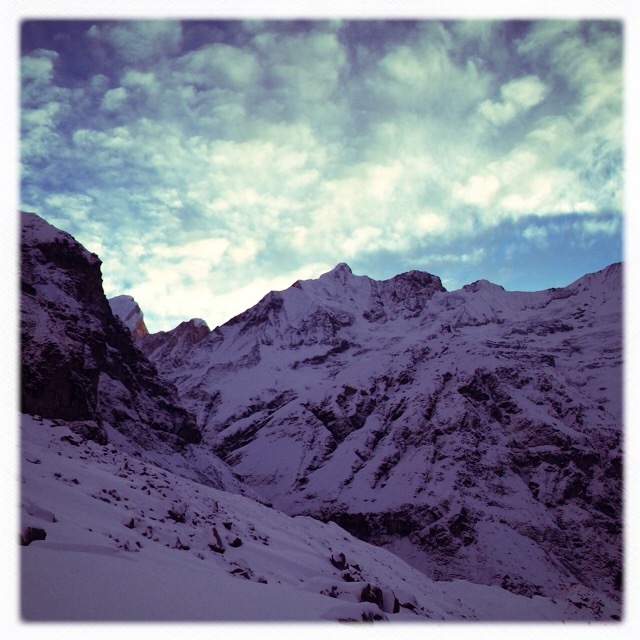 Each time I managed to look up, I saw a stream of light from our head torches and fresh, powdery knee deep snow. The pain I felt from altitude sickness was now overtaken by my desire to get to base camp no matter what. I had to concentrate on each step and each swing of the pole, almost meditatively moving forward one count at a time. Stopping was not an option. 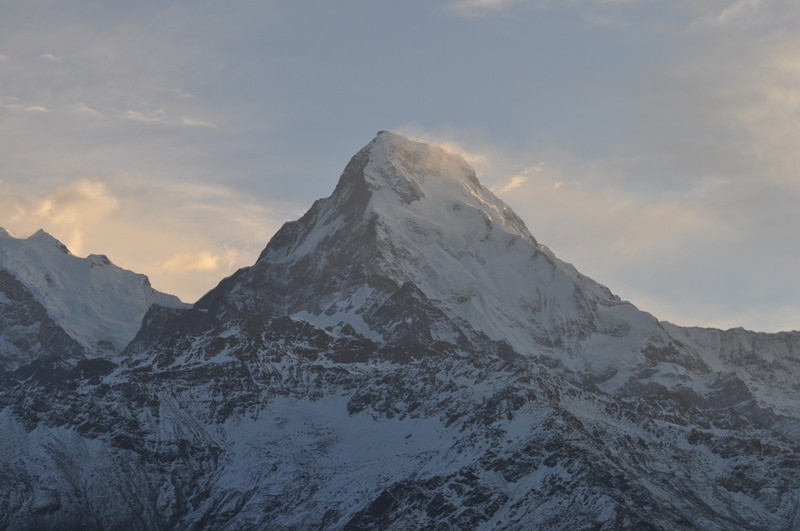 After an hour and 45 minutes, the sun was up and light ricochet off Annapurna’s jagged peak. Bright, white light also rebounded off the crisp, fresh snow and it was hard to remember that it was still only 6am. 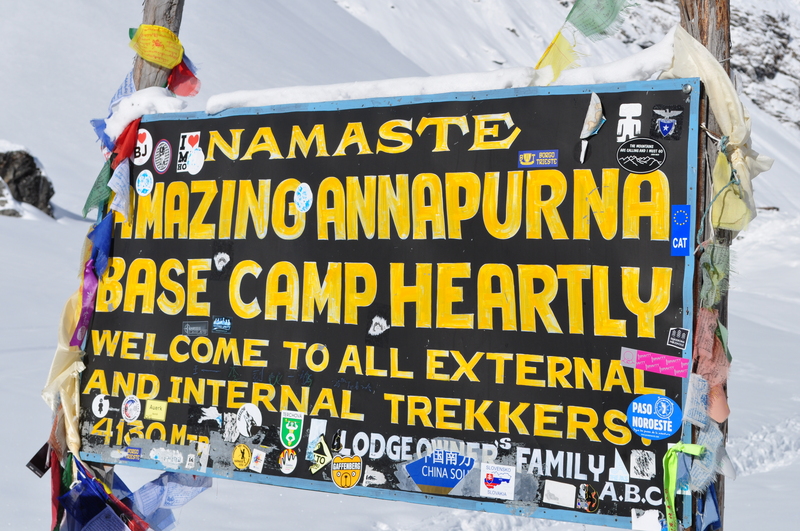 On reaching the Annapurna base camp sign, weary climbers suddenly regained composure and found the energy for numerous photos and celebrations to mark their achievement. The atmosphere was certainly jovial and a far cry from the feelings of pain and intense concentration of an hour earlier. Even though we had reached base camp, we had a little further to go and as the excitement and adrenaline waned, despite the bright sun light, energy was draining. 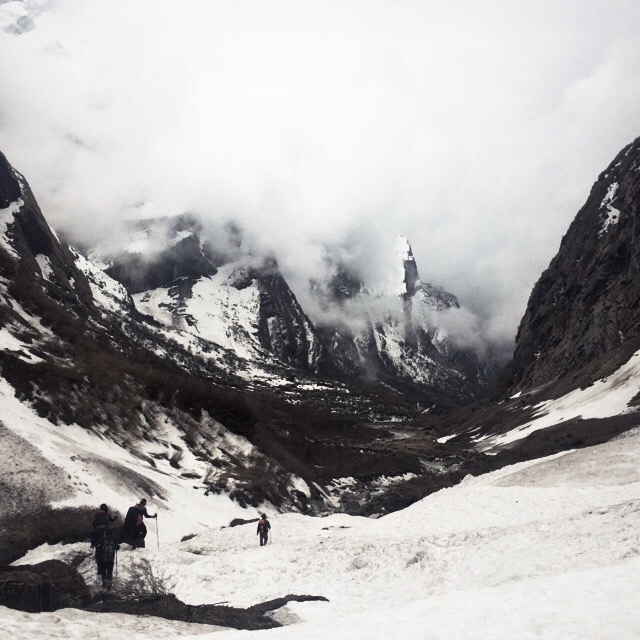 We walked up to a precipice overlooking one of Annapurna’s glaciers. We now stood a good 20 meters or so above the glacier and in places the drop was sheer and we needed to keep our wits about us, despite our exhaustion. 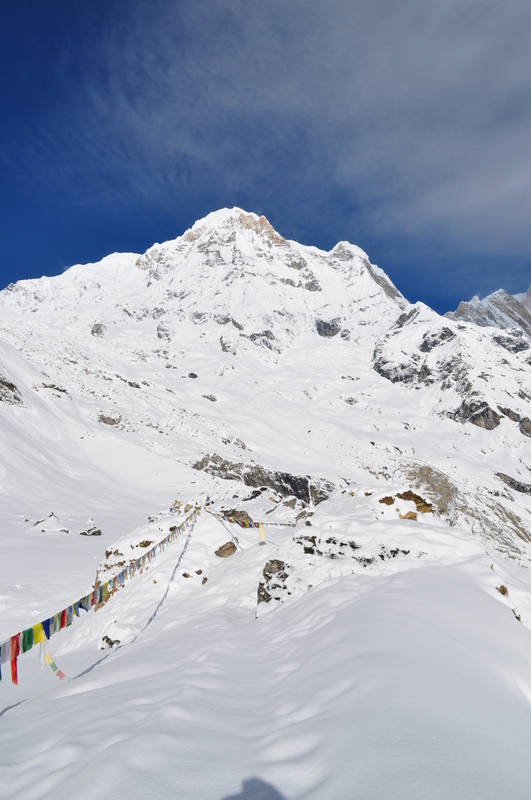 Here, beautiful prayer flags swept forward towards Annapurna’s peak as this was the original base camp sight. The brightness of the morning only enhanced the incredible silvers, blues and bright whites of this incredible mountain range. Up above, helicopters headed over to Annapurna 2 and in the distance, the roar of avalanches only served to remind us that much of natures beauty comes great risk and while we had now made it to our goal, we had to descend back through the avalanche risk area, on a warm day after heavy snow fall. Alarm bells rang, echoing Octobers tragedy. We were swiftly on our way back to MBC to collect equipment and beat a hasty descent. However, we were lucky and made it back down to Dovan safely, very privileged to have witnessed such an incredible sight that will remain with us for ever. 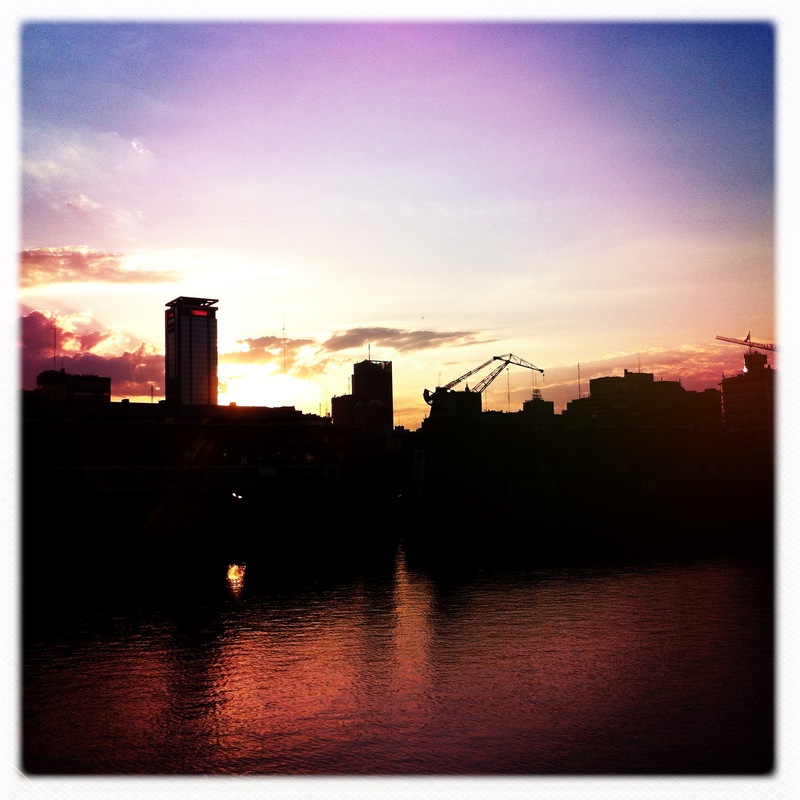 London Adventures – Urban Climbing. 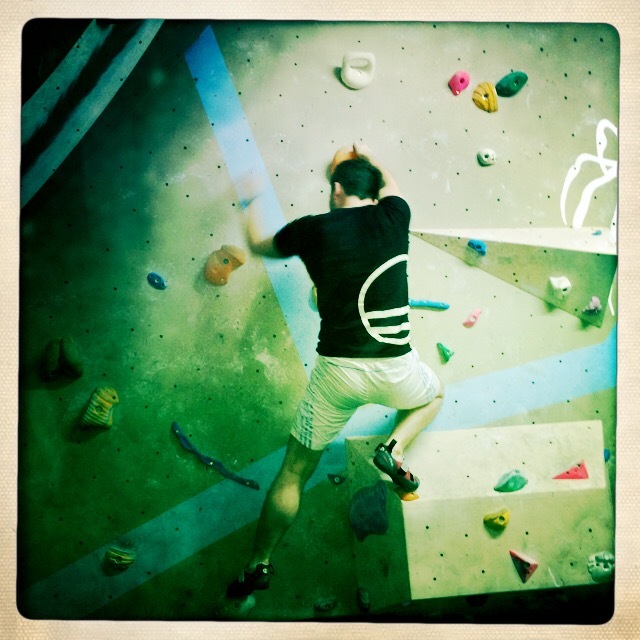 Bouldering at The White Spider. 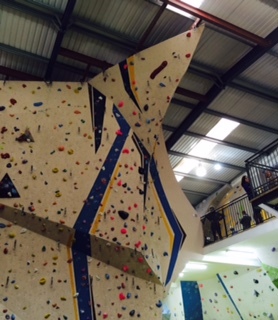 Hailed as London’s newest climbing centre, The White Spider is also one of the UK’s largest and having frequented a number of climbing centres in the past few years, is one of my favourites as one I go back to time and time again. Having climbed there a number of times since it’s opening in the summer of 2012, I notice that it has always been busy. However, this in no way detracts from the experience. The White Spider easily caters for its growing number of clients which spans a variety of age ranges and demographics. 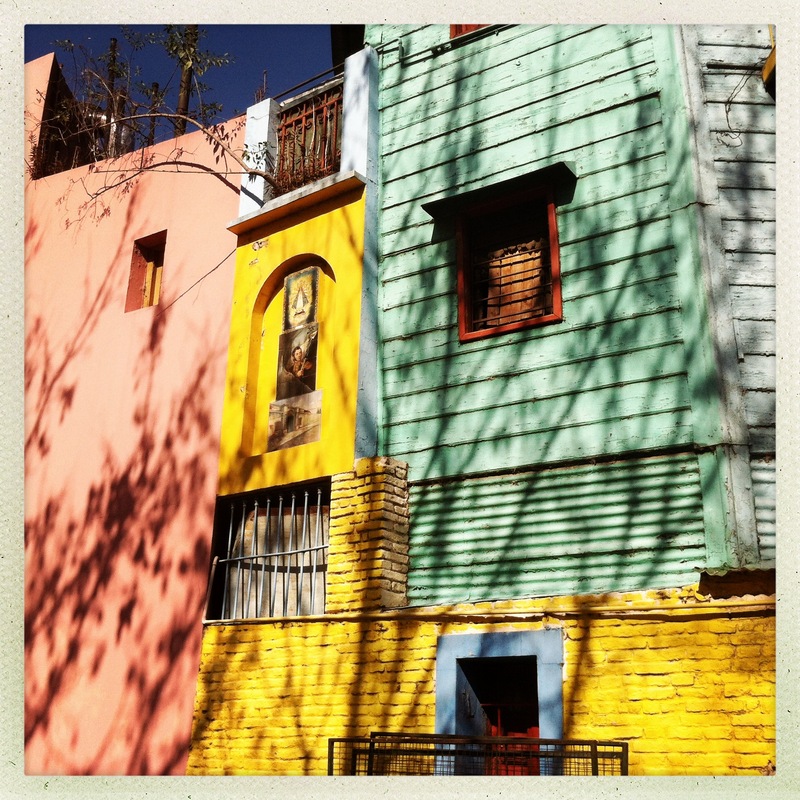 ‘Chamuyar’ is the local’s word for ‘smooth talking’ and if I was to personify the Buenos Aires district of Caminito, that’s exactly what it would be: Sultry, moody and irresistible. My beaten up cab winds around traffic and through what looks like a dilapidated, disused, car park. Dusty wires hang from battered concreted ceilings like jungle snakes poised to strike. The bright sunlight of the day seems distant here in this dark dingy maze where some locals can be seen taking refuge from the day. Suddenly light breaks through, and the docks greet my eye line, I breathe a sigh of relief. 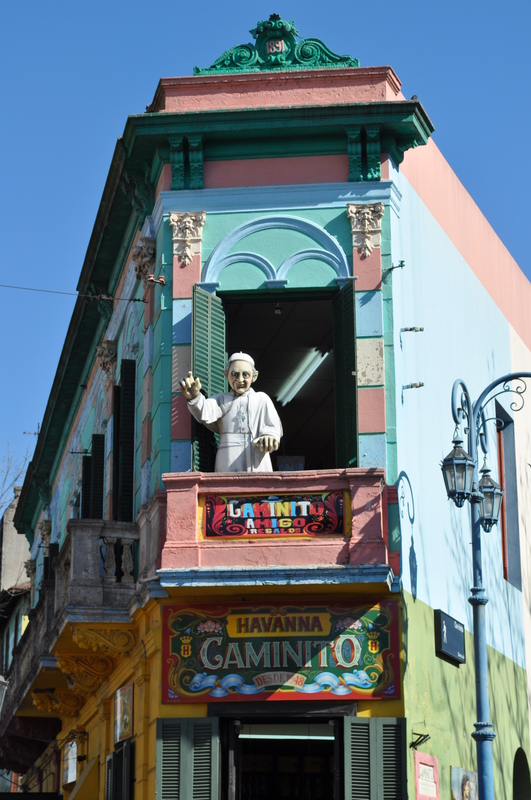 When quizzing fellow Buenos Aires travelers about a visit to Caminito I was warned profusely to be careful, which is why I’ve arrived in a cab rather than on one of the many America style buses that weave through the city. Heart beating somewhat quicker than it should, I step out of the cab rather tentatively clutching my camera and hiding anything that might be mistaken for valuable. Like I say, I had been warned. What immediately hits me is a cacophony of Latino beats and melodies. Coming from all directions is the unmistakable staccato waltz of Tango music….I find myself drawn in immediately and follow in the direction of the music. I then find myself weaving in and out of a plethora of street sellers and market stalls. Vast collections of clothes, jewellery, art and antiques catch my eye and I almost don’t know where to start. Stepping, side-stepping and weaving through the crowds the sensory overload continues and I am bombarded by colour. 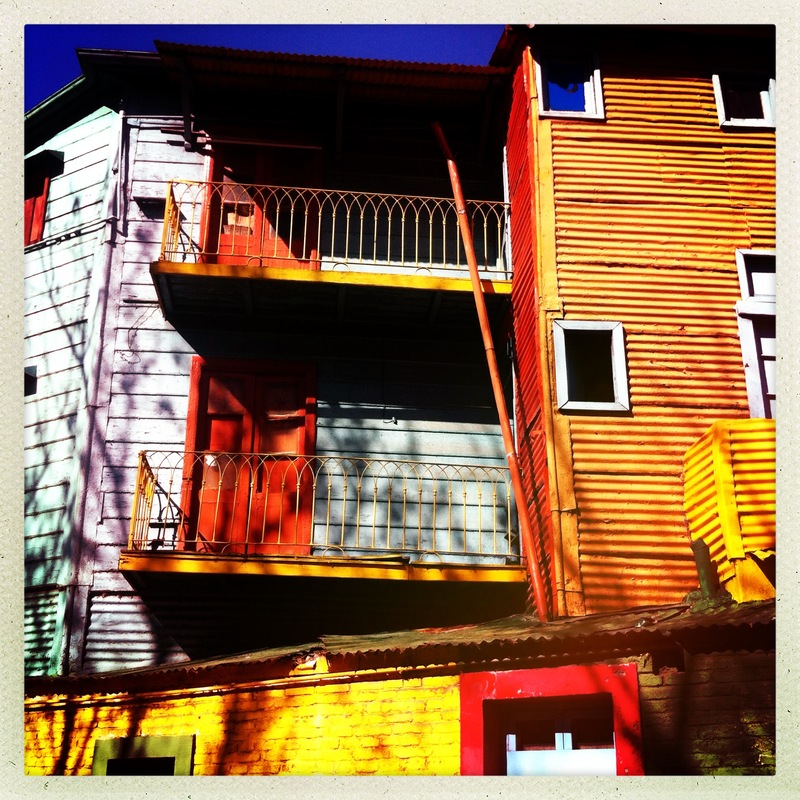 Vibrant buildings line each of the main streets, each one screaming to be looked at. If it’s not the intense hue of the architecture that catches your eye it’s the caricature statue that shoots forth out of the wall, window or balcony. 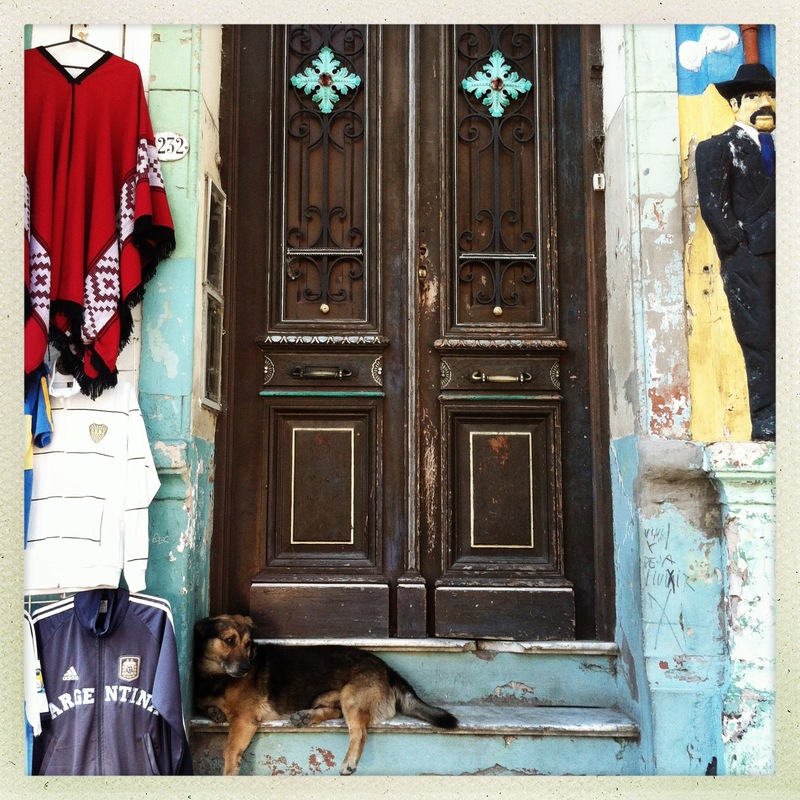 All of Argentine pop culture history is here, including Maradonna and Evita of course. One of many Caminito caricatures. In reality there are only three main streets which tourist are advised to wander in. Stray away from these and there is a reduced police presence and the vibrancy that blares at the senses is stripped away and the distant sound of crowds and fading music becomes some what eerie in the face of lonely, empty streets. 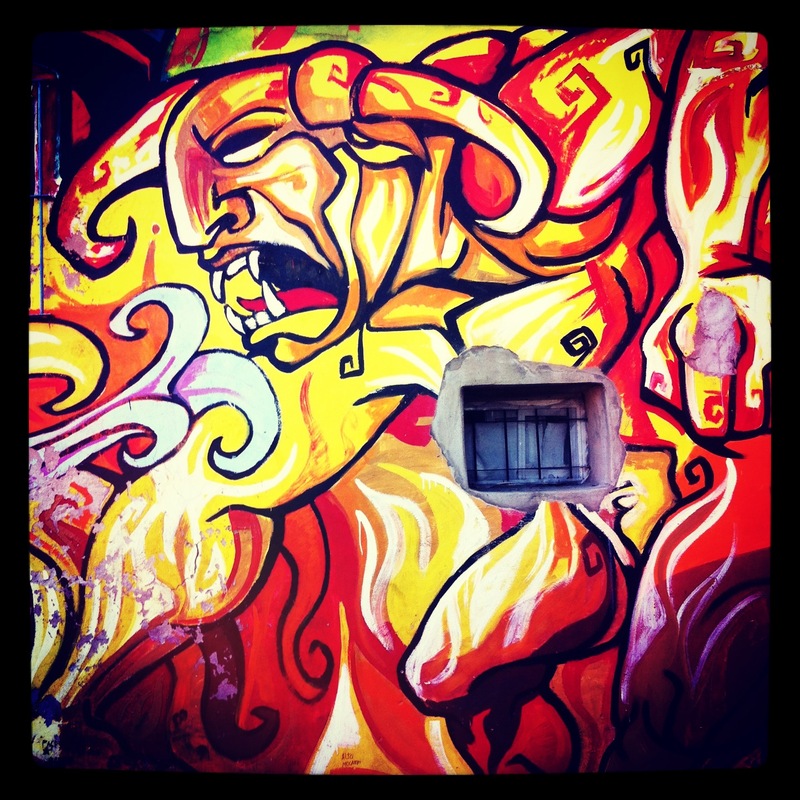 That said, I do wander briefly to investigate the incredible exhibition of street art. I mean exhibition in its most organic form in that it sprawls across walls, windows and doors in all its glory. It’s worth straying briefly from the hustle and bustle of the main streets as the vivid colour of the buildings is mirrored in the vibrancy and detail of the graffiti displayed. Taking a couple of shots, I begin to feel a little uneasy and scurry back to the relative safety of the crowds. Once the assault to the senses of sights, music and smells becomes all too much, I find a cafe and order a coffee accompanied by a sumptuous dulche de leche biscuit ( well deserved I think). Dulche Leche is a sweet caramel goo that pervades many Argentine cakes, biscuits and sweets. Delightfully, a bowl of the delicious thick amber spread is often available at breakfast hotel buffet tables to smeer on your pastries to your hearts content. Right here, right now, it complements the intense, aromatic coffee that I’m enjoying whilst watching the world go by. As I look around I notice many others just willing away the time with a coffee, Malbec or Quilmez beer in hand taking in the show of street musicians and lithe, skillful and passionate Tango dancers everywhere you look. These Tango duos must dance all day every day but they enact every performance with the passion and fire that is synonymous with the famous Argentine tradition. The warnings received prior to my visit were not misplaced and it is advised that caution should be taken on a visit to Caminito. However, as with all risks, there is also a rich reward to be gained if you are prepared and careful. 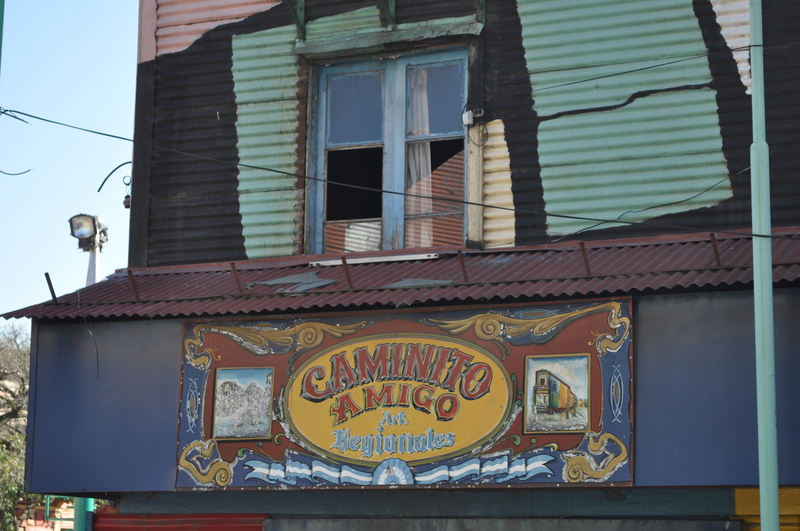 I firmly believe that Caminito is a jewel in the Buenos Aries crown. As my cab pulls away from the docks, heading back towards the main square of the city, crowds of LA Boca Junior fans are headed towards their beloved La Bombonera (stadium). Later that evening, I watch the game, Quilmez in hand in one of Palermo’s many stylish bars. The stadium thunders with jumping La Bocca Juniors fans, tickets fly and rhythmic chants can be heard echoing around the rather fragile looking stadium. 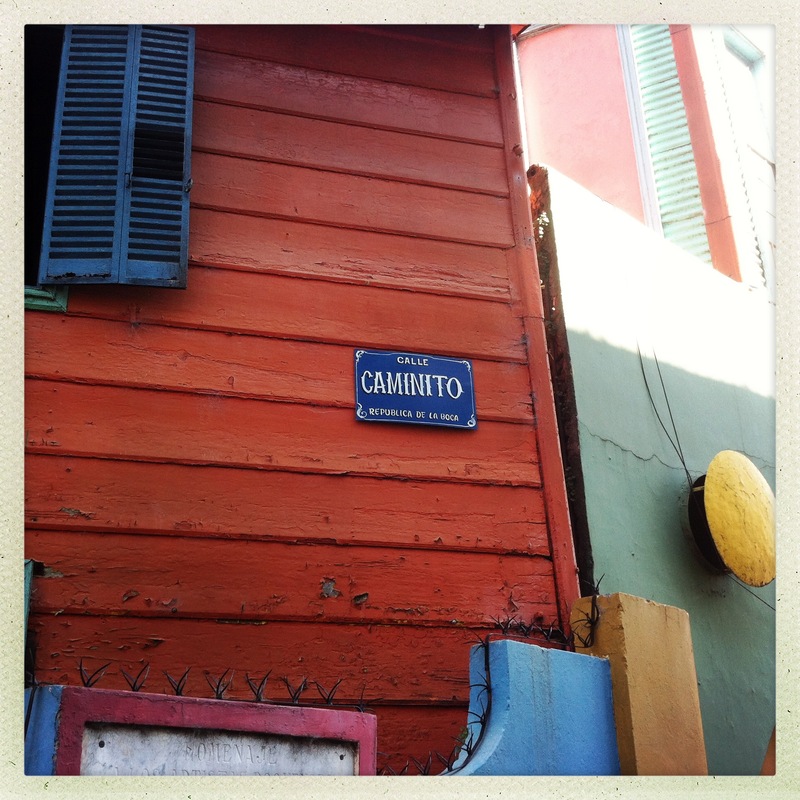 Passion, music, life and vibrancy are abundant here and that thought takes me back to my earlier visit to Caminito, that’s exactly how I would describe it and I would not have missed it for the world. 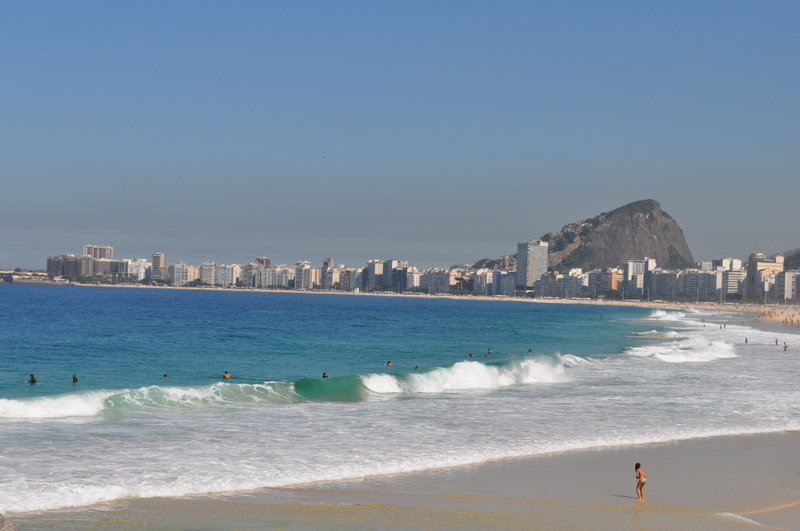 Rio de Janeiro: A surfing haven. I would consider myself relatively fit, attending Military fitness classes 3-ish times a week, running half –marathons, numerous 10k’s and one marathon. Also, having surfed since the age of 16, I have surfed breaks all over England, in Spain, Biarritz and Vietnam. I realise that this currently sounds like a bad online dating profile but bear with me, I will put this into context. So, while I mention that I have surfed for a long time, as Matthew Syed points out in his book ‘Bounce’, what builds expertise in a discipline is actually the number of hours practice one has had. Therefore, despite many years trying to master this sport, I am still inexperienced and need a lot more practice. However, when I decided to embark on a surf trip to Brazil, I knew it would be amazing but nothing that I couldn’t handle. Wrong! 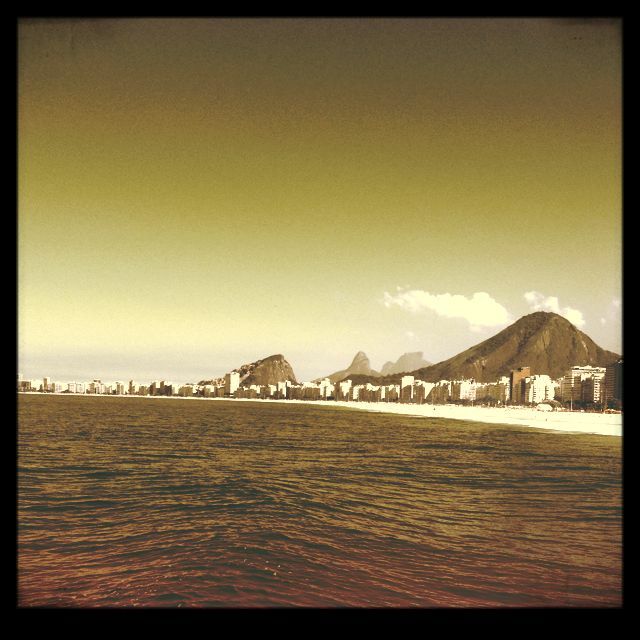 Barrel upon barrel of relentless, perfect wave smashed upon the golden shore of the Copacabana. That’s right, I said ‘smashed’. These waves were perfect in every way, the stuff of surf dreams…..in fact, they look almost manufactured. Yet, they were brutal. Rising up like a rearing stallion, they fell just as quickly, rapidly turning to white water that sucked the sand from the beach and, if you’re off your guard, you with it. 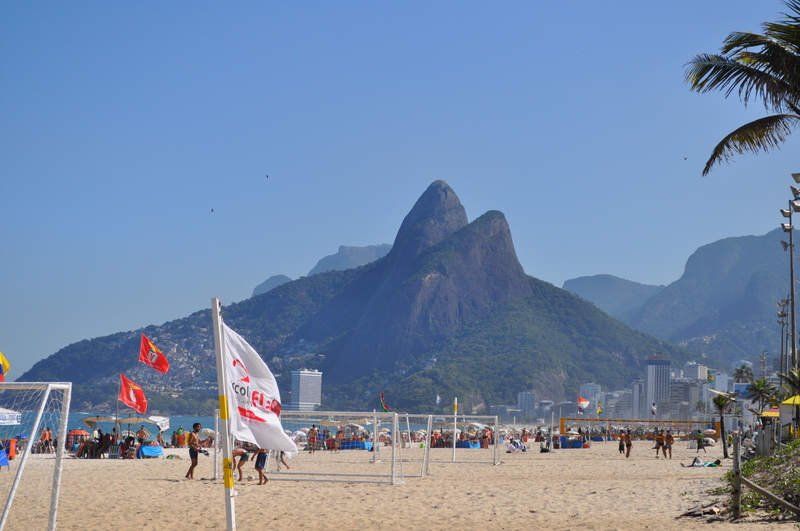 Mildly perturbed, I then headed over to investigate Ipanema, hoping for a more friendly break. I got this at a cost. As each perfect wave swelled forward, it became evident that swarms of surfers were venomously competing for space on each and every wave. Crashing waves on Ipenema beach. Becoming increasingly aware that surfing Rio’s femme fatale waves could become dangerous I needed to find a way in. Luckily, I was en route to a solution. 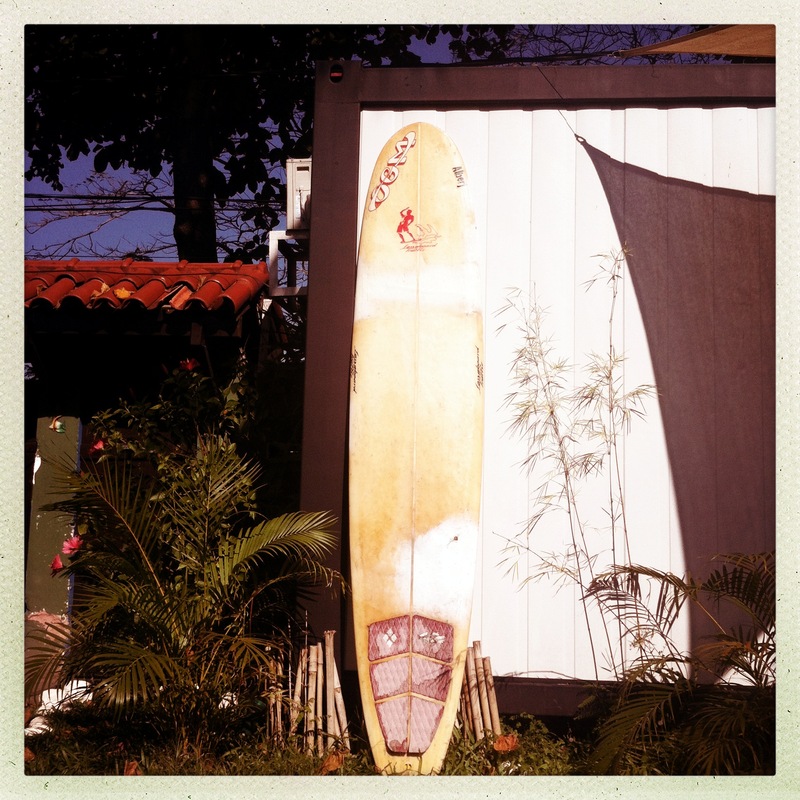 ‘Rio Surf and Stay’ offers expert surf tuition and a place to stay all in one. Located on the outskirts of Rio in the Recreio dos Bandeirantes district, it’s a surf haven away from the tourist crowds of the better known beaches. This is where those in the know come to surf and I can see why. The surf and stay packages are reasonably priced and include equipment, tuition, room and breakfast. There is also plenty here for very experienced surfers who may normally scoff at the thought of joining a surf school. But what this offers is local knowledge and experience of the best (and quietest) breaks as well as the best times to go in order to avoid the crowds. This invaluable knowledge makes my surfing time in Rio much safer and therefore more enjoyable, leaving me free to focus on the business of improving my technique surrounded by beautiful scenery characteristic of Rio such as the iconic sugar loaf mountain. My favourite time to surf here is the morning. I’m not really a morning person, but once the alarm blared I was greeted by the smell of fresh coffee and bread wafting up from the downstairs outdoor kitchen. Once I managed to drag myself out of bed, my eyes were greeted by a colourful assortment of fresh local fruit. It’s important to get a good breakfast as I soon discovered. The sun beat down as I swam out through the crystal blue water. Then smack! A monster reared up before me, seemingly from nowhere and before I knew it I was half way back to the beach again…..my board, several metres away. One of the most important lessons that I learned from this session was how to actually battle out through these waves in order to catch a break to ride in. They were incredibly powerful and if you didn’t learn how to get through them, you’d never make it more than five metres away from the beach. Luckily, with two instructors on hand for just five people I received plenty of much needed advice. 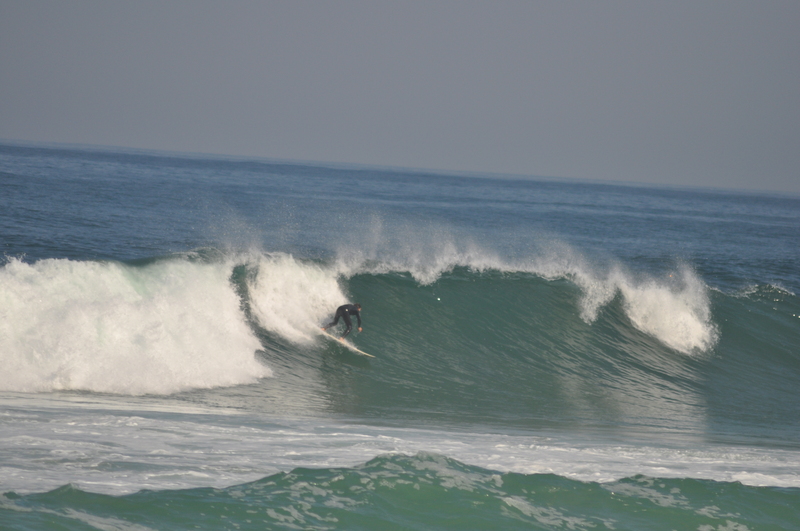 So, I’d battled my way back through the relentless smashes and was now ready, waiting patiently for my next wave. I was exhausted already! Putting my head down on the board I actually considered taking a brief power nap right here as my board bobbed around warmed by the suns morning rays. No chance! Suddenly, I heard my name bellowed from about five meters away. Jolting up, I saw an instructor pointing to a swell speeding towards me. I was slightly terrified. Paddling hard I picked up speed and then I was up. These waves were incredible, the exhilaration of catching one of these was unbelievable and I tried to ride it as long as possible. Back in the water, I couldn’t stop smiling! As a paddled out once again, I looked around and took stock of my surroundings. Bright blue skies, azure waters surrounded by palm trees and the beautiful distant back drop of Rio. After a couple of hours, we headed back for a much needed rest and refuel which was easy in the chilled atmosphere of the hostel. However, it wasn’t not long before we headed back out again. This is where my opening paragraph comes into context. Despite my relative fitness, I struggled this afternoon. We visited a different, slightly busier beach but the waves were just as powerful, booming to the shore with regular ferocity. Again, whilst waiting to catch a wave I took stock of my surroundings. The statue of Christ the Redeemer (though tiny from this distance) stared down from its high vantage point beneath a pink sunset. As the sun set, we prepared to catch our last wave of the day whilst the samba beats of Rio could be heard from the beach as the locals prepared to dance the night away, Caipirinha in hand. For me this is one of those scenes that I hope will flash before my eyes on my final moments. I’m exhausted but this has been a perfect day. I’m looking forward to sampling the local beer tonight and then doing it all again tomorrow. VYAADAHIKANA – ‘It is possible’. For years now, an increasing number of travellers have volunteered as a way of gaining a real insight into the authentic lives and cultures of those people with whom they choose to live and work. It offers a far richer experience in terms of giving travellers a truer knowledge of a place and people in terms of economy, politics, geography, agriculture, education….the list is endless. Philanthropists can feel that through their trip, they have given back to society, helped others and changed lives. It’s true that through the rich travel experience that voluntourism offers, lives are changed but not in the way that we would necessarily think or hope. Whilst my experiences of voluntourism has been wholly positive, they have not been entirely as I expected. Feeling truly humbled I left acutely aware that my presence had not changed the lives of those I’d left behind but that my interaction with the people involved had actually changed me. Mine was the life that had changed and been made richer. 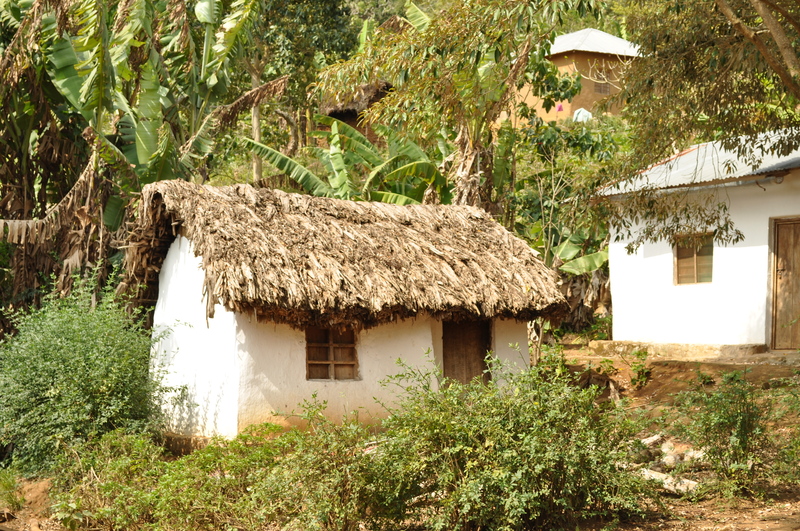 Yamba is a small village sitting at an elevation of 4384 feet (roughly the height of Ben Nevis) in the mountains of the Tanga region in Tanzania. Sitting amid the lush green forests atop the mountain, the village stares out over the peaks rolling into the distance. This location provides a number of problems for its villagers. 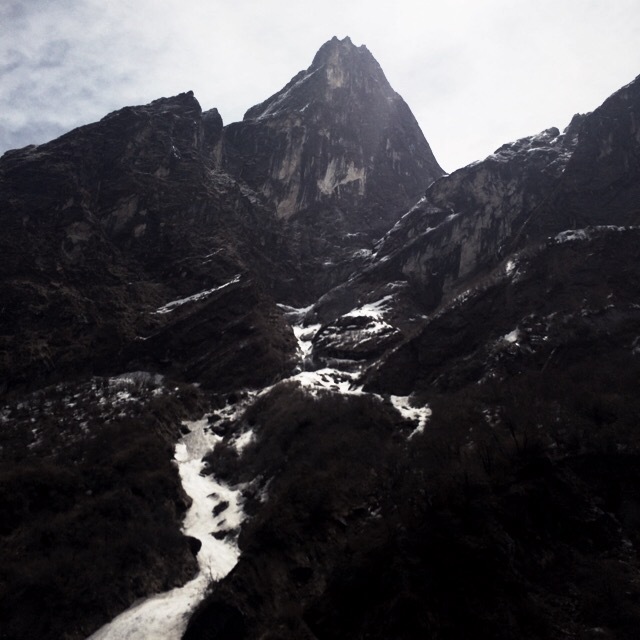 Just a few years ago, there was no road to the foot of the mountain and therefore getting to hospital was an arduous sometimes impossible task, particularly in an emergency. With no ambulances available and no way of transporting patients there was a high mortality rate among both adults and children. In a small, close community, the effects of this were devastating. All aspects of life were impacted and for those that did survive, life was unimaginably tough. Village Africa is a charity set up by Caroline Johnston to provide sustainable development to the village of Yamba with the focus on improving health and education first and foremost in order to provide villagers with the knowledge to build and sustain a better life, thus reducing death rates and improving life chances and opportunities across the villages varying demographic. 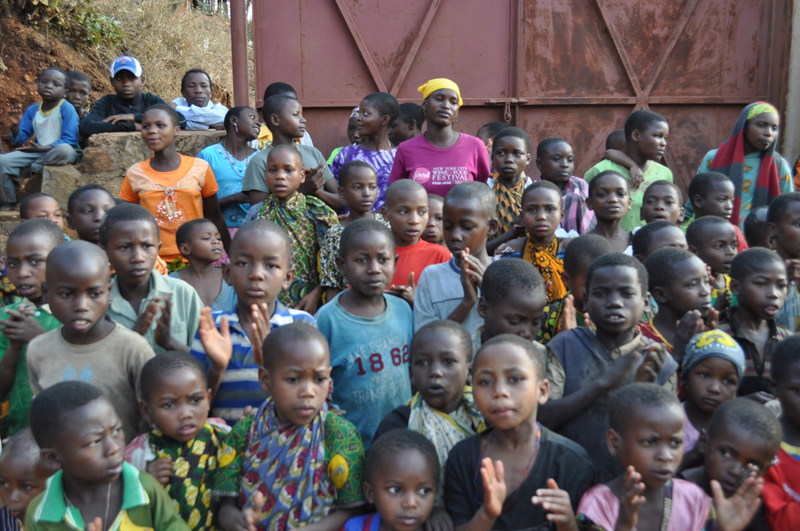 The work that Caroline and her dedicated team have done is incredible and a testament to the Village Africa mission statement that ‘it is possible’. A child hood friend of mine returned from Yamba a few years back so impassioned and humbled by her experience that I was inspired and I too wanted to go to Yamba to help and see what I could do. Stepping out of the jeep I wanted to throw up! We left Kipepeo this morning at some ungodly hour and the epic voyage that began in the dark this morning, half an hour ago climaxed with a jeep ride up the mountain. Now, I’m really not a fan of heights and we had just been thrown around a packed vehicle up a mountain the height of Ben Nevis and every time I gazed out of the window for some sign of encouragement I was slapped in the face with the view of a sheer drop. The 4 x 4 can’t go any further so we have to walk the rest of the way. In my eye line there seemed to be a rather large, by my reckoning, fairy sheer rock face that needed to be climbed before we could go any further. So, apprehensively, out of the jeep I got. Tears sprung to my eyes. Not because I was anticipating an arduous climb or because I was fighting back the nausea of that ride, but because I’d been met with a wall of smiles and song. It seemed that the entire village were there to greet us and the cacophony of melodic singing wrapped around us and any anxiety melted away. I was blown away in fact. Gazing at the crowd, the children beamed triumphantly and were clearly very curious about who we are and what we were doing there. Some were more reticent but most danced around us chuntering happily in the broken English that they’d been learning in school. Lifting my rucksack out of the jeep it was immediately snatched away by an old lady. Before I had time to wrestle it back, she’d sprinted off up the mountain with it. Let’s bear in mind that I carried it like it was harbouring bricks; this seemingly old lady scampered off as if it were full of marshmallows. I felt terrible! Granted, there was a short walk to the village from here but it was truly beautiful. Making our way through the long foliage we had to be mindful of snakes but we saw none. 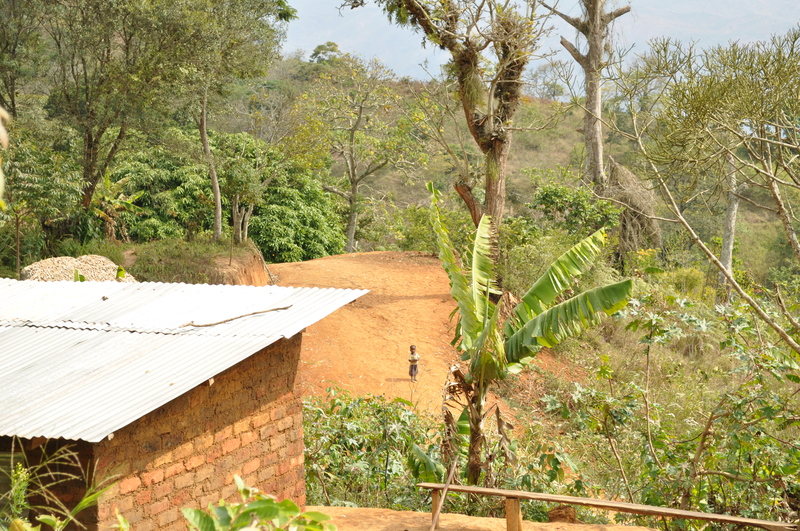 Once we arrived at the village we were met by a collection of small, mud house. Inside they consisted of one or two rooms, a bed or two, maybe a table. Life generally happened outside, as a vibrant, close community. Immigration laws in Tanzania changed just at the point of our arrival in Yamba and so our original plan to assist with projects and teach in the school had to be abandoned. However, the next two weeks were spent visiting, learning and being inspired by Caroline, her team and the villagers themselves. What stood out for me was that despite the hardship these people lived in, they demonstrated a zest for life that was infectious and yet incredibly humbling. These people could not do enough for us. We were welcomed into homes and despite our relative wealth; everyone we met was desperate to give. Whilst visiting some of the housing projects in the village, we met a 35 year old woman. She lived in a house of one bed room, with five children, her husband had died a year or so earlier. Village Africa was in the process of building her a new house at the time, with more room for her children who were now delighted to be attending school. We sat and talked with her for a short time. As we rose from the small wooden blocks that acted as seats, she motioned for us to wait as she hurriedly scampered outside. She returned with three eggs from her chickens that aimlessly wandered in and out of the house. Once again, I stifled the rising lump in my throat and tears that stung my eyes. These three eggs could have fed her and her five children but she wanted to give them, and she seemed truly over the moon to be able to do this for us. I was stunned by the complete lack of selfishness. This was a theme throughout my time in Yamba. 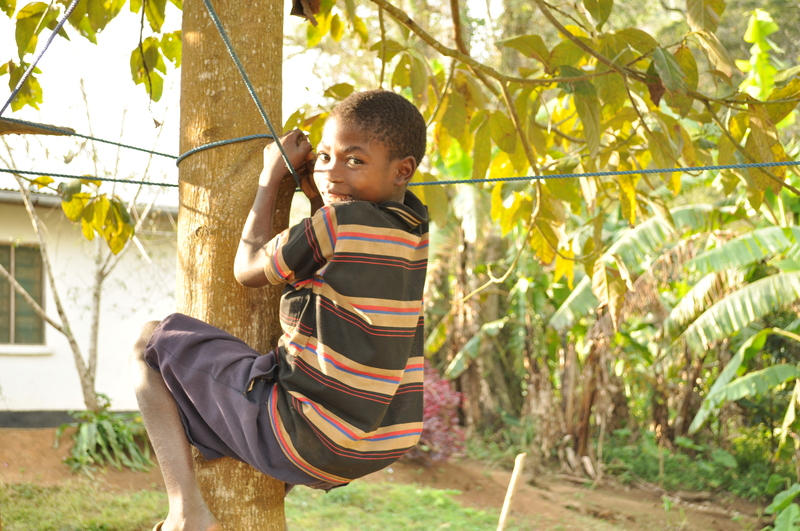 Whilst, we weren’t allowed to work with the children in an official capacity in school, we endeavoured to teach them through play and stories during their free time. One day we’d organised a sports afternoon at which the entire village seemed to be in attendance. 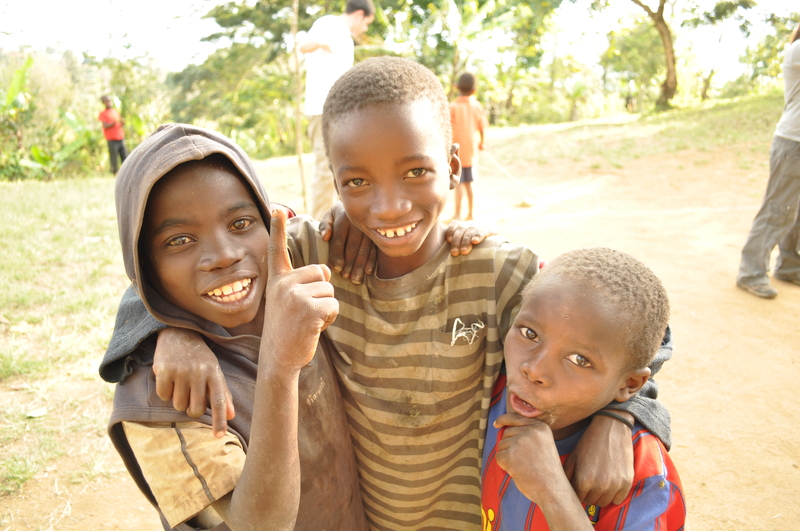 One of the charities missions has been to ensure that the villagers and in particular the children, all have shoes. Wearing shoes prevents direct contact with the rust red sand that contains small worm like creatures called jiggers which burrow into the skin through the sole of the foot. Inevitably, however supply sometimes outweighs demand and some of the children attending the sports afternoon were not wearing anything on their feet. This didn’t stop them and they give it their all. Returning to the village from the relatively flat patch of ground that we called the sports ground, I stopped dead in my tracks. My flip-flop had broken and so I continued bare foot worrying about jiggers. Just then a sprightly young lad of about 12 who’d been on my relay team sprinted behind me, grabbed the knarled flip-flop out of my hand and continued on up the hill, looking back only to shoot me with his stellar smile. Limping tentatively, I continued on my way somewhat bemused. The following morning, I heard a knock at my hut and wearily made my way to the door. I looked around and saw nothing. Then I noticed my shoe. Fully mended. I peered around again, drawn to the sound of a low-pitched giggle. Shyly hiding behind a tree was the young boy from yesterday. Waving timidly, he scampered away and was gone. Picking up my shoe, once again I am blown away by the humbling kindness of this child who I later found out took my shoe home to his father begging him to fix it for me. There are many more stories such as this that I could regale you with from my time in Yamba. I tried to help in ways that I could while I was there, I left most of my clothes and shoes when I left. On my return home I signed up for a marathon to raise money for Village Africa. However, I was under absolutely no illusions that my trip to Yamba changed the lives of those that lived there. They had in fact changed mine. I left inspired by all those whom I came into contact with in Yamba and during those times now when I read or hear about the evil that humans can bestow upon each other I think back to my time in Yamba and remember the kindness, humility and beauty of the folk that I encountered. All photo’s by F. Wiltshire. It's 2:00 am... What's in YOUR library?